1965 NASA photo. 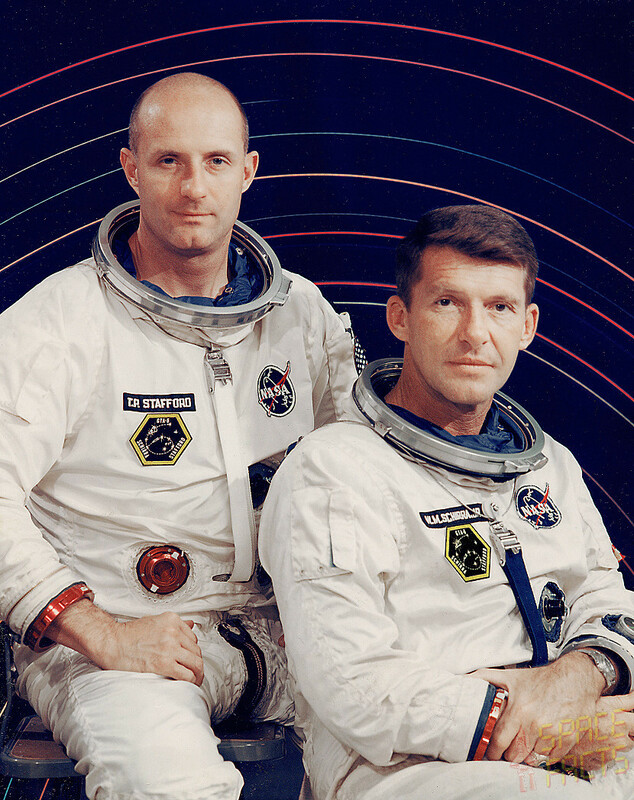 From left, Thomas P. “TP” Stafford and Wally Schirra, prime crew of Gemini 6. Photo located on the great archival Web site Spacefacts. Gemini 6’s mission objectives involved pioneering rendezvous in space (with the original long-duration spaceflight hostages champs, Gemini 7). Evidently, Gemini 6 also pioneered the use of the Best Ever Muslin Photography Background In Manned Spaceflight History, with the dizzying-solar system-y thing depicted behind TP and Wally. The two astronauts look less like seasoned space rendezvous experts, and more like two disgruntled public television kids’ show hosts. Seriously, this shot looks like the incidental publicity photograph for a proposed television show “for the kids!” NASA cooked up in the 1960s with some leftover change they found under John Glenn’s abandoned old bunk bed. The show probably lasted two episodes on public television, and from the start was plagued by incidents involving wildly inappropriate U.S. Navy “sea stories” from Schirra and lots of cuss words from both astronauts. …Then the proverbial final nail in the venture arrived with its “special guest stars!,” the Gemini 6 backup crew. Their backup crew just happened to be…Gus Grissom and John Young, who caused a minor case of on-the-ground heart attacks when they somehow managed to bust out sandwiches in space. After a U.S. Navy “reminiscence” extravaganza between Schirra and Young, NASA then probably decided the show should be permanently banned, and the tapes were destroyed. The name of Gemini 6’s show? “The F**king Solar System.” TP and Wally never got around to discussing anything vaguely scientific on the show, though. From 1965 onward, if anyone mentioned the TV show at any NASA function, at all, they would automatically get fired. And that, my friends, is what this mission portrait looks like. TP and Wally are wearing those pressure suits for your protection.